Thanks to everyone for voting on which herb to cover next. Cleavers is an important restorative spring herb. As with Rosemary, this will be a series of short posts designed to focus on just a few aspects of the herb at a time. I’m trying my hand at using infographics, please note that there’s a discussion topic posted at the end of the infographic. You ought to get an idea of some of the conditions that Cleavers would help, besides those mentioned directly. Please use the comments area to discuss. 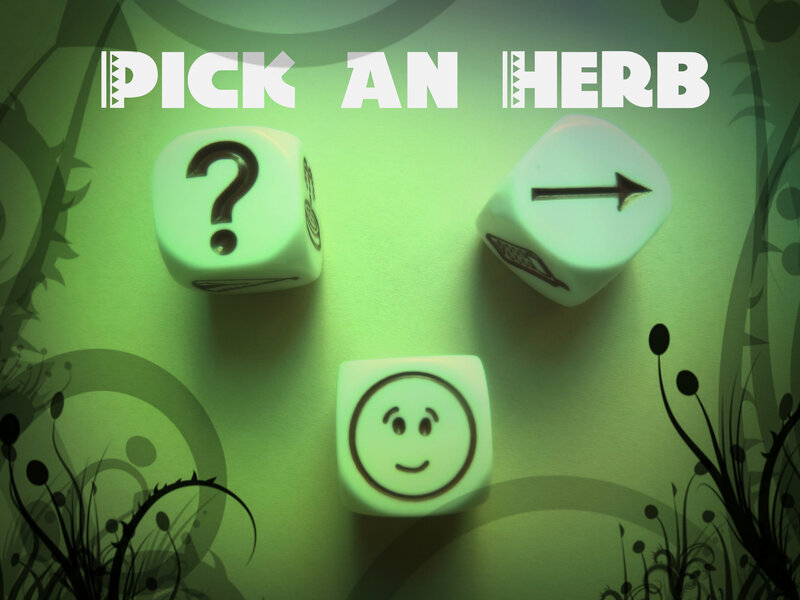 I’d love to know which herb you would choose for the next herbal series. Its been a few weeks since the Rosemary series ended and I can feel the urge coming on to start another one. Is there a particular herb you’d like to focus on? As some of you know, I’d completely abandoned this blog for a couple of years to focus on the school. Then I noticed folks were subscribing and reading it so I started writing again. One of the really cool things Rosemary does is to block oestrogen, which promotes certain kinds of breast cancer. Research done at the State University of New Jersey demonstrated that a 2% concentration of Rosemary extract was able to inactivate excess oestrogen. How? Possibly by stimulating the liver enzymes responsible for inactivating the oestrogen hormones, oestrone and oestradiol. We’ve already discussed how it can protect cells from radiation, obviously another way it can prevent cancer. But it does more to protect our DNA, through its antioxidant compounds: vitamin E (its a rich source), monoterpenes, phenolic diterpenes and flavonoids. 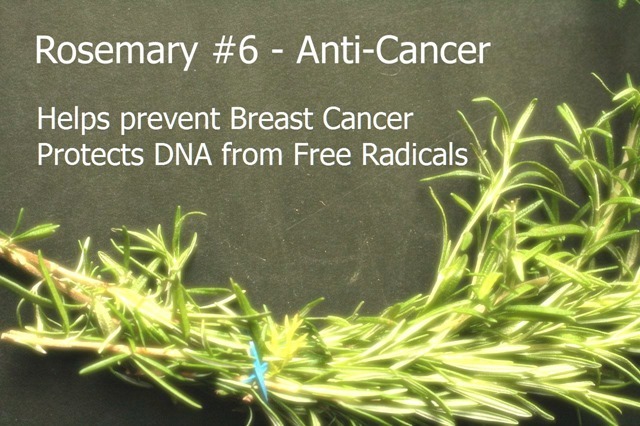 Research done at the department of Mutagenesis and Carcinogenesis, Cancer Research Institute of Slovak Academy of Sciences, in the Slovak Republic proved that Rosemary was able to significantly protect DNA from free radical damage. Furthermore, in a study looking for agents effective against cancer cell lines,two components of Rosemary, carnosic acid and rosmarinic acid, showed direct anti-proliferative actions resulting in recommendation by the authors to consider Rosemary as part of cancer treatment with predetermined doses to prevent toxicity. And this, my friends, is the final quickie post on Rosemary. There’s still much more to this herb which I’ll be covering in a video. Meanwhile, check out the 70 some odd recipes I’ve added to our Ozark Herbal Academy Pinterest site on the culinary uses of this majestic herb. Used in powdered form, alone, or combined with other repellent powders or diatomaceous earth. Its been tested against the following and found effective: Staphylcoccus aureus , S. albus , Vibrio cholerae , Escherichia coli , and Corynebacteria, Remember that as a rule of thumb, direct antibacterial actions of herbs only apply to putting them in direct contact with the bacteria. So, for example, an external manifestation of staph would respond to topical Rosemary applications. The essential oil is recommended but you could also make a strong wash or compress using an infusion. Rosemary oil has been found very effective in preventing the spoilage of meat due to gram negative and gram positive bacteria, I suppose this would make rosemary a good choice for marinades. Candida albicans does not flourish in its presence, nor does Aspergillus parasiticus. Rosemary is one of the herbs used for chronic Candidacis. Rosemary essential oil is a traditional remedy for scabies. 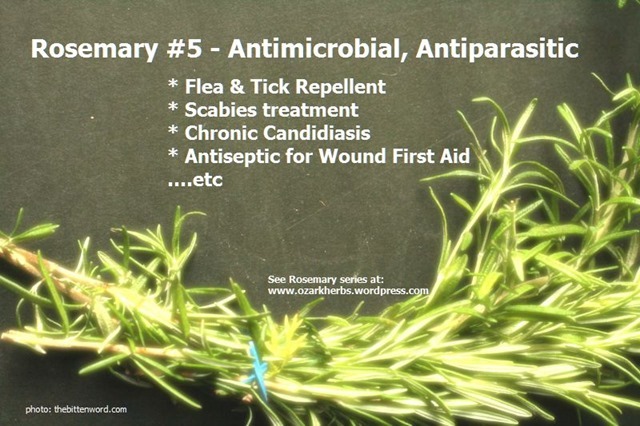 Dr. Linda White and Steven Foster state that rosemary is a useful remedy for many types of parasites, and washing the infested parts of the body with rosemary tea may stop a scabies infestation. We get mixed reports here. According to tradition, it works but a clinical trial evaluated it as a failure when it comes to head lice. As usual, finding specifics about what quality and formulation of rosemary was used in the study is missing. Rosemary is added to our cuisine for more than gustatory pleasure. It can actually improve our digestion of starches and vegetables, relieve an upset stomach and halt flatulence. Rosemary’s constituents, caffeic acid and rosmarinic acid act as antioxidants and anti-inflammatories which will go to work in the digestive system right away. 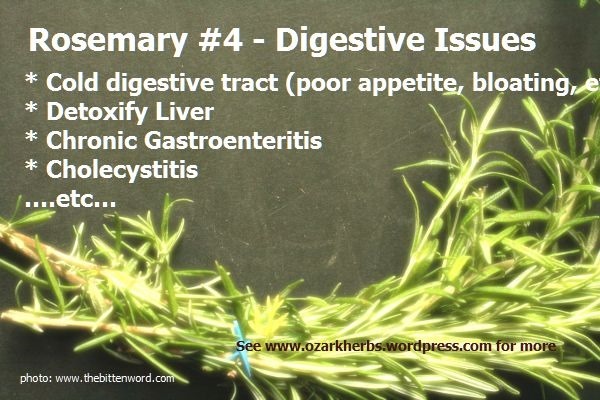 If you consider the energetics of Rosemary, as a warming, stimulating herb, you’ll easily associate it with the type of digestive issues its most suited to: cold digestive issues. These generally manifest as a lack of appetite, bloating, gas, and constipation. I especially like it combined with Oregon Grape Root for the liver issues, and is additionally helpful in a pattern that often includes excessive, dilute urination from kidney deficiency and low blood pressure as well as inability to digest protein/fat efficiently. Anything that can reduce the strain on the liver in its efforts to clear the body of toxins is an important ally, especially when a liver becomes sluggish. Researchers at National Institute of Agronomic Research in Dijon, France, discovered that Rosemary actually boosts the activity of detoxifying enzymes like cytochrome P450, glutathione transferase and quinone reductase , speeding up the elimination of toxins from the liver. Rosemary also helps by stimulating the flow of bile. Actually, Freud advocated cocaine for “whatever ails you”. Partly because he got so much benefit from using it himself, partly because he was paid handsomely by two competing drug companies to promote it. What I find so shocking about this is — nothing much has changed in the “depression business” since cocaine fell out of official favor. Its been a parade of one drug after another, sponsored by pharmaceutical companies, loyal psychiatrists and media to the detriment of those who are having some real problems in life. In fact, recent statistics show that these psychotropic drugs result in 700,000 adverse reactions and 42,000 deaths a year in the United States and Europe. Folks, this really has to stop. Depression can be successfully treated without the use of dangerous drugs. This is the first of a series of posts outlining the problem. We’ll then invite you to discover the solution. Hop on over to my other blog at Ozark Herbal Academy to follow this series, click the direct link here. Do you use a cell phone? WiFi? Have you been exposed to ionizing radiation? A new study shows that the risk for glioma (brain cancer) was tripled among those using a wireless phone for more than 25 years and that the risk was also greater for those who had started using mobile or cordless phones before age 20 years.These exposures also carry a high risk of other cancers and cardiovascular disease. Thankfully, along with other precautions, Rosemary can help us. ….non-ionizing communications radiation in the RF/microwave spectrum has the same effect on human health as ionizing gamma wave radiation from nuclear reactions. Its hard to believe that our familiar Rosemary is an effective natural agent to protect ourselves from radiation, but science says its true so let’s look at some of the studies. Ionizing radiation generates massive free-radical production which damages cellular DNA. Four constituents found in Rosemary; carnosol, carnosic, rosmarinic and caffeic acids, ward off damage from radiation poisoning. One study explored several compounds for their ability to protect cells from gamma-irradiation. As reported in the British Journal of Radiology, February 2, 2009 the fat soluble carnosol and carnosic acids in rosemary “provide highly significant protective anti-mutagenic activity”. It turns out that powerful water soluble antioxidants can’t match rosemary’s antioxidant activity against radiation damage. Even so, another study shows that water extracts of Rosemary were able to prevent skin damage from UV exposure. Plants that grow in full sun develop strategies to protect themselves from excessive radiation. Rosemary is a good example of such a plant, whose sun protective compounds extend to those who consume it.Take, for example, it’s Rosmarinic acid. It acts as a photo-protector to the skin by scavenging free radicals and inducing the body’s own endogenous defense mechanisms. For example, malonyldialdehyde, one of the toxic compounds formed after exposure to UV radiation, it’s formation was inhibited by Rosmarinic acid. Rosmarinic acid was 3.34 times more effective in this action than any other compound tested. While taking Rosemary orally was found effective in protecting the skin from UV damage, it seems to me Rosemary essential oil would be ideal to add to your homemade sunscreen. Try blending coconut oil with a few drops of Rosemary EO. Another constituent of Rosemary, Caffeic acid, was found to protect human lymphocytes from intense gamma radiation, finding that when lymphocytes were pre-treated with caffeic acid they were positively modulated against all radiation induced changes. Journal of Biochemical and Molecular Toxicology, 2008. This animal study determined that Rosemary extract was a good radio-protector against lethal doses of gamma radiation. Animals were pre-treated with various doses of Rosemary extract prior to exposure and the dosage of 1000mg/kg of body weight turned out to be the most effective. This is more than I’d want to be taking on a regular basis but if I knew we were about to be exposed to high levels of gamma, I’d aim for this dose short term as a pre-treatment. The German Commission E monograph on Rosemary suggests 3/4 to 1 1/4 teaspoons (4-6 grams) a day. An infusion can be made by adding 2 teaspoons (10 grams) to 1 cup (250 ml) of boiling water (removed from the heat) and steeped, covered, for at least 15 minutes. Strain and sip several times a day. Its standard to use the tincture at 2-5 ml (1/2 – 1 tsp) three times a day, HOWEVER, high doses of Rosemary can damage the kidney so I recommend using the smaller dose of tincture, 1-5 drops. Rosemary essential oil can be added to skin lotions, oils or creams to use directly on the skin at a 2% dilution. While culinary use is safe, medicinal doses of this herb are not recommended for those suffering from heat conditions. If you experience sharp headaches, flushing, increased pulse, roaring in the ears …this herb is not for you. Back off of it, or try using it externally as the essential oil. Never use this herb in high medicinal doses, greater that the above recommendations, because it can cause digestive upset, kidney damage and even convulsions. Do not use medicinal doses during pregnancy, it can act as an abortifacient. 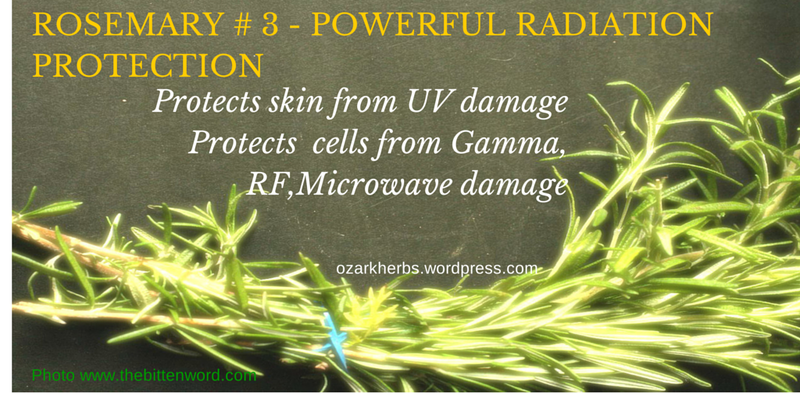 Ozark Herbal Academy offers a course on Radiation Protection that covers all of the risk factors and what to do to protect yourself, including the use of rosemary herb.